Happy Monday everyone! Since it is the first Monday of the month, it is time for another Tehcnostamper Monday Lunchtime Sketch Challenge. 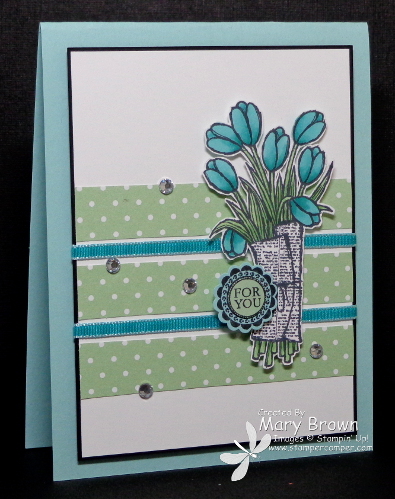 Mary Jo has a fun sketch for you and I decided to ‘change it up’ a little bit for my card today. For the month of May I’m trying to use things that are retiring and/or Occasions Mini item. I pretty much got it all in there on my card! I just LOVE this tulip image…it is sooo pretty! 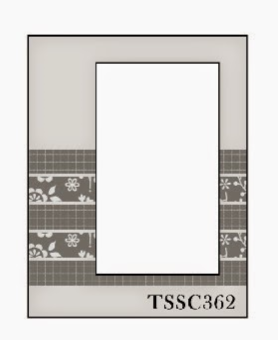 Whisper White – 3 5/8 x 4 7/8, add strips of Pistachio Pudding (Incolor dsp paper stack) 5/8 x 3 5/8 to the panel. Layer onto Basic Black 3 3/4 x 5, wrap pieces of Bermuca Bay 1/8″ Taffeta Ribbon then add panel to card front using dimensionals. Stamp Tulip image using Memento Black on Whisper White. Color in using Bermuda Bay and Wild Wasabi Blendabilities (I soooo wish we still had these! ), cut out image and add using dimensionals. Stamp image from A Round Array using Memento Black on Pool Party and Pistachio Pudding, punch out using 7/8 Scallop Circle Punch and 1/2″ Circle Punch, add to card front using dimensionals. Add Basic Rhinestones to finish it off. What a fun sketch for us this time…I hope you can join the fun! Don’t forget to check out the other members of the team and remember go to the Technostamper blog to play along! This entry was posted in Spring Mini, Technostamper Challenge and tagged A Round Array, Love is Kindness. Bookmark the permalink. This is so pretty, your fussy cutting really makes a difference on this. I too love these tulips, so easy to make beautiful cards with! Love the soft blues and green. Just stunning. Thanks so much for being on the TSSC team.